The Watson Firm offers tough representation for personal injury and criminal cases. Call now for a free consultation with the Pensacola attorneys. Whether you are dealing with serious injuries caused by another's negligence or facing a life-changing criminal violation, make sure to entrust your case to the Pensacola attorneys of The Watson Firm. The premier firm has the extensive experience clients need to achieve favorable results. Since the firm's establishment, the legal team has successfully litigated against insurance companies, Fortune 500 companies, law enforcement officers, prosecutors, and other individuals. With The Watson Firm on your side, you can be sure that you have a strong advocate on your side. The firm is committed to helping clients like you pursue justice for personal injury cases, wrongful accusations of a crime, violations of civil rights, employment discrimination, and denied Social Security Disability claims. The Watson Firm also has a proven track record, having recovered millions of dollars in settlement and verdicts. Additionally, the firm has received an AV rating from Martindale-Hubbell and the Client's Choice Award from Avvo.com. 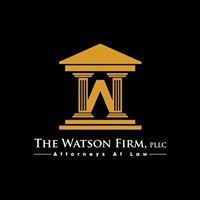 For more information or if you wish to secure The Watson Firm's representation, call and schedule a free initial consultation. All personal injury cases are handled on a contingency fee basis, which means that you don't pay unless the firm wins your case.